William “Wink” A. Wilford - With great sadness we share the news of Winks passing on Wednesday, February 28, 2018. Beloved husband of Elsie (Matheson); loving father of Scott (Tricia) and Jonathan (Sarah); proud papa to Mykayla, Bevin and Cole; brother-in-law to Carol Wilford, Eleanor Harris, Leone Matheson, Jean Matheson; and fondly remembered by many nieces and nephews. Predeceased by infant son William; parents, Dr. William & Mrs. Irene Wilford; brothers James “Cookie” and Peter Wilford. 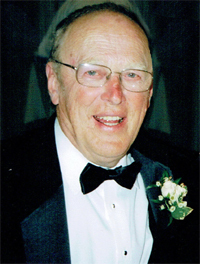 Wink was a loyal employee of the Co-operators Insurance of Owen Sound and Guelph; Past President of the Owen Sound Golf and Country Club; and enjoyed hockey, baseball, hunting, fishing, golf and watching the beautiful sunsets in Oliphant. Friends are invited to gather with Wink’s family at the Thomas C. Whitcroft Peninsula Chapel, 272 Berford St, Wiarton (519) 534-5341 on Friday, March 2, 2018 from 7-9pm, where a service to celebrate Wink’s life will be conducted on Saturday at 1 o’clock. Private family interment at Greenwood Cemetery. If desired, expressions of remembrance to BPHS Foundation Wiarton. Condolences may be expressed online at www.whitcroftfuneralhome.com “It’s been a good round, see you on the 19th hole”.